The Royal Oak city fathers have put up a shelter for Amtrak passengers just south of 11 Mile Rd. off Sherman Dr. The design they came up with is excellent, considering the constraints on the amount of space available. 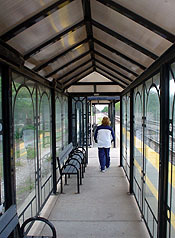 The shelter is dark steel with plexiglass windows, bench seating, it’s well-lit, and has radiant heaters. Many SMART bus routes converge at a major transit station in the tan building immediately to the west. SMART routes operate for the morning and evening trains. A taxi dispatching office is also located there, so getting a cab is not a problem. 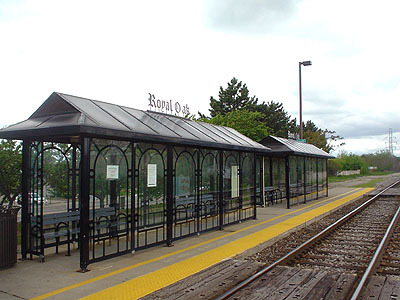 To get information on SMART routes and schedules, call (866) 962-5515 Monday through Friday between 9:00 a.m. and 5:00 p.m.
Royal Oak must be seen to be appreciated. This has to be one of the hippest, liveliest year-round downtowns for a city this size anywhere in the country.